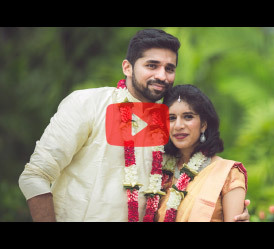 Pooja and Anand's wedding video starts with a rhyming poem penned by the couple. The words are accompanied by poetic frames captured against the sunset at the beautiful boutique hotel Chunda Palace in Udaipur, Rajasthan. We find out a little more about them in the opening frames itself - he is the 'Happy' one, and she is the 'Loud' one - and they seem like a match made in heaven given their love and friendship which have been evocatively captured by Ankita and Akash, the duo behind WeddingNama. The couple hails from Mumbai and met through a common friend. They realized they both share a love for scuba diving and bonded over that common passion. Both wanted a destination wedding, and Pooja specifically wanted a Rajasthani palace wedding. So she chose the Chunda Palace. The regal and restored ramparts of the erstwhile palace play a key role in this wedding video as it filters the picture-perfect rays of the sunset through its ancient arches, offers balconies for the pretty bride to gaze out of, lights up the screen with its pretty blue indoor mosaic frescoes - and has an inviting pool for the guests to splash into despite the nip in the air at this February wedding. 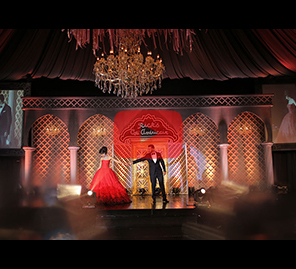 The photographers recollect the shoot, saying "Pooja and Anand wanted a royal affair, this was just the place for it! The entire film was shot by just three cinematographers, including aerial, underwater and movement shots, as we wanted it to be as unobtrusive as possible to capture all the fun." One of the most memorable shots in the video is the drone images of the palace from above as it is lit up with lights during an evening function while the rest of Udaipur sits silent and dark beneath the palace’s boundary walls. Also of note are the opening drone shots that capture the venue and its surroundings in glorious details before the sound bytes emerge. The film captures a lot of dancing and drama of this young couple in love. The soundtracks include a Bollywood number as Pooja is partial to film music. In the background, running through the video, are the gorgeous guests, overflowing emotions, glamorous bridal dresses and infectious energy of this young dynamic couple- and of course, the history and heavenly environs of the magnificent palace.